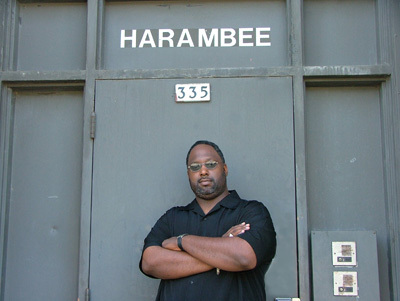 If you live in the Harambee neighborhood, chances are you’ve had a visit from Craig Wroten, lead community organizer and building liaison for Harambee Ombudsman Project, Inc (HOPI). His job takes him door-to-door to talk to people about the needs in their community, and sometimes what they need to do in order to become successful participants. Sometimes, what they need is to have an abandoned car moved, help dealing with a gang-ridden or generally “filthy” block, or getting their homes up to code. Other times, they have a question or problem that doesn’t exactly warrant calling the police. But Wroten knows who to call and what the community needs in order to survive and thrive. “My job is to help eliminate red tape and allow people to connect to areas of city government during a time where many feel the government is out of reach,” says Wroten. Harambee is a Swahili word that means “pulling together.” And for a little over twenty years this grassroots organization has been doing just that, via direct action, advocacy and community services. They do so despite budget cuts, funding deficits and the absence of sufficient people power. This makes this husband and father of three’s role as community organizer especially challenging. “We could use eight community organizers here — instead we have one, myself. I am stretched pretty thin,” he admits. Implementing neighborhood improve-ment programs (that at times include grants to eligible homeowners), facilitating the community prosecution unit and crime prevention department and coordinating neighborhood strategic planning are among the jobs he assists in performing. Like so many other community-based organizations, HOPI operates on a shoestring budget, love and passion for the community and a commitment to harmonic and prosperous living for its members. Wroten says that each block is uniquely different and he could spend a week or more on each block, solving problems and addressing complaints. Unfortunately, his hands-on time is severely limited. “I just gotta hit it and quit it,” he laughs. What helps him is HOPI’s successful partnerships with other community organizations like Career Youth Development, the SDC victim assistance program, the YMCA Community Development Center with organizers at Holton Youth Center and the Northside Y, Hillside Boys and Girls Club, Northcott Neighborhood House and St. Vincent’s Food Pantry. The District Attorney’s office is also starting to offer its support more readily in terms of prosecuting offenders and offenses being reported by HOPI. It was easy for Wroten to identify major issues in the Harambee community. He says adequate, affordable housing; drug dealing and prostitution; lack of parental control and supervision all have negative effects on the neighborhood. And from those, other issues spin off. He explains, “We must come up with innovative ways of addressing issues. We are a great referral source, but we can’t do everything.” What they can do is provide training to residents who are looking for jobs, specifically soft skill training like how to get a job interview and what to wear to it. Offering this kind of employment preparation assists those who are job ready to gain more confidence and skills when the right job (or any job for that matter) shows up. In the meantime, he encourages residents to attend community meetings, voice their concerns and engage in the overall climate and activities in the community. Wroten’s job can be uniquely hazardous, especially when he has to approach a neighbor about a problem that has been reported. Residents at first question his authority as he shows up with his clipboard and a list of complaints. But when they notice the overall quality of living improving, they eventually get on board. Of course, his job doesn’t include a badge, a gun or even a walkie-talkie to call for help. He has had bottles thrown at him and his windows busted, yet he remains undaunted. “This can be a stressful job, if you allow it to be. But as long as people are calling me saying thank you for helping them feel safer, that they sleep better at night, or expressing their appreciation for having an eyesore like an abandoned automobile removed, I know I have done my job.” Harambee Ombudsman Project, Inc. (HOPI) is located at 335 W. Wright St., Milwaukee 53212. Phone: 264-7822.